Way back in 1989 something wonderful happened to me. A friend introduced me to the wonderful world of 16-bit gaming via the glorious Amiga 500 computer. He showed me wonders never seen before! Strip poker with almost recognisable digitised ladies. Stunningly animated wonders like Defender of the Crown and It Came from the Dessert. The one thing that blew my mind, and stuck with me so much I saved every penny until I purchased my own Amiga, was a title from an up and coming Amiga studio called Reflections and their publisher Psygnosis. That title was Shadow of the Beast. Yes 26 years ago Shadow of the Best was unleashed on an unsuspecting world. Created by the legendary Reflections team (now represented mainly in spirit by Ubisoft Reflections) this game was stunning on every level bar one – the gameplay. Oh yes the gameplay was unforgiving and if you made it past level 2 you’d have some serious skills. It was repetitive and infuriating at times. So what was the big deal? The game looked incredible. Multiple layers of parallax scrolling, wonderfully animated and crafted sprites and a 16-bit soundtrack that was simply awe inspiring from David Whittaker (look him up kids!). Quite simply this was the pinnacle of home video game entertainment. A lot changes in 26 years and Psygnosis, who became Sony Studio Liverpool, are no more. Reflections were purchased by Ubisoft years back and the Shadow of the Beast name disappeared from public view… until the Sony conference in 2013. An entire clutch of Amiga gamers collective hearts leaped when they heard that a new Shadow of the Beast was coming. Yet sadness grew as nothing was heard of since that day… that was until this year at E3 and Gamescom when the game resurfaced under development from mobile game producer Heavy Spectrum Studios. Finally getting my hands on this game after all this time I was positively giddy. There was zero queue for the game as I lined up at Sony’s 18 booth at EGX. This made me even more nervous and slightly sad for the old timer. This reboot continues to follow the story of Aarbron. Captured as a child he’s forced into becoming this efficient killing-machine. If the plot follows that of the original Shadow of the Beast then Aarbron will undertake a mammoth journey to take revenge on Maletoth for the atrocities he has committed. Previously a game of exploration and side-scrolling combat the new take on the series sticks closely with this formula. 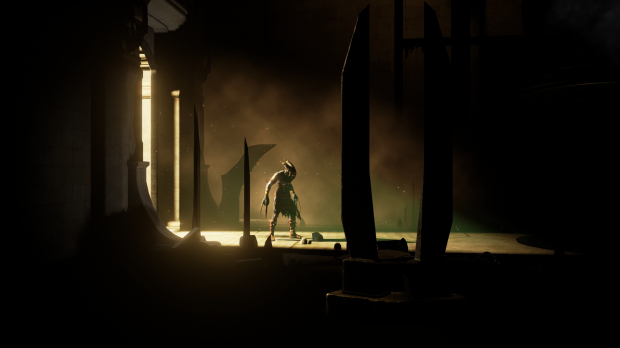 You control Aarbron in a 2.5D environment that’s both richly details and starkly bleak. The land you find yourself in, certainly in the demo, looks a far cry for the greens and blues of the original Amiga title. The game looks absolutely stunning, and running at what appears to be a blisteringly smooth 60fps in likely 1080p it’s hard to fault it technically. Much like the original title this is something to behold when moving. My initial disappointment to to be greeted with the rousing pan-pipe infused score of David Whittaker’s original Shadow of the Beast title track are short lived (I have hopes it’ll be in there for the final product!) as I take control of Aarbron. Long gone is the weedy punch or flailing kick that you had to defend yourself with in the original Amiga edition (damn bats!). Now you have a satisfying set of moves to perform. Some stun enemies, some throw them around the screen and others shred enemies like their meat-puppets. 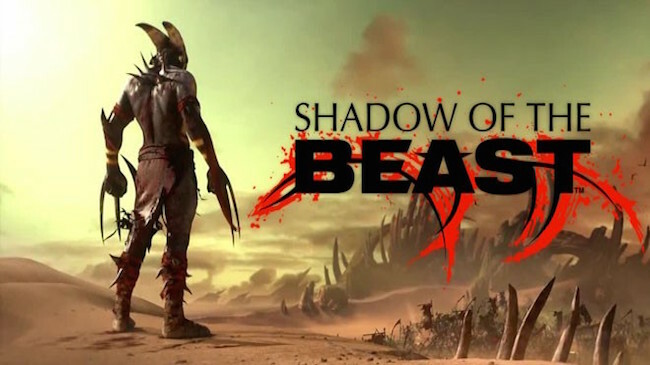 The combat feels starkly modern and shook my thoughts of what Shadow of the Beast really should be in the year 2015! This wasn’t the game I remembered and immediately felt like it was trying to shoehorn this modern violence and tone in to a beloved memory. In fact it wasn’t until an hour or so later that my mood changed on Shadow of the Beast. This wasn’t the game I remembered playing, but, I reasoned, it really needed not to be – that game has its day back in 1989! What we have is something akin to Shadow of the Beast by way of a 2.5D God of War. The moves are brutal and bloody. The game is gorgeous and there appears to be an amount of exploration to do as well. My time was brief, maybe 15 minutes in total. What I managed to glean from that short times is that this isn’t my Shadow of the Beast – it’s a new shiny version that tips it’s hat and embraces the spirit of my Shadow of the Beast whilst polishing it up splendidly for a modern console. It remains to be seen when the game ships next year (we presume as no date has been mentioned!) whether the entire product can sustain interest for several hours. It manages to capture a little of the vaguery of the original. The “Why is that there?” or “What on earth was that skull placed there for?”. It layers subtle fan service throughout the demo levels and offers up something that’s starting to feel more than a little special. 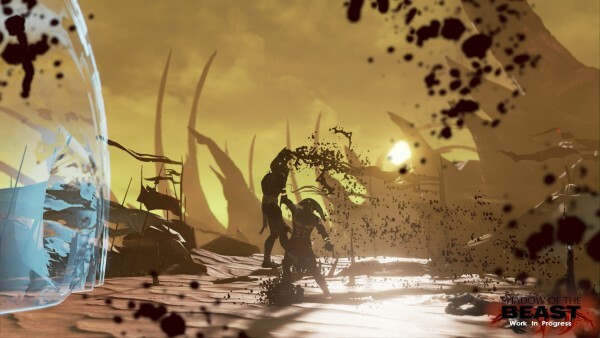 With a forgotten pedigree, stunningly beautiful visuals, slick intuitive controls and an interesting combat system Shadow of the Beast is set for an interesting return. Although I have quiet confidence the team can pull it together I’m still apprehensive as to how it’ll play on a longer playthrough. What’s certain is the team at Heavy Spectrum have a knowledge and reverence for the original Shadow of the Beast that fills me with hope for the pending PS4 release.